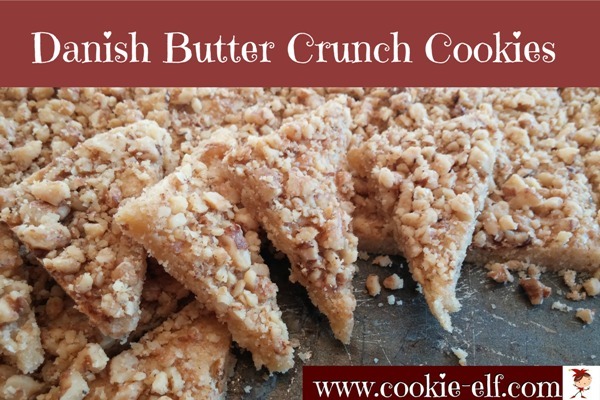 A cross between bar cookies and shortbread, Danish Butter Crunch cookies have a shortbread-type crust, layered with nuts on top. Preheat oven to 275º F. Grease and flour a 15 x 11 jelly roll pan. In a medium bowl, using an electric mixer on medium speed, cream butter and sugar until light and fluffy, scraping the bowl continually. Separate egg, pouring the egg white in a separate, clean bowl. Add egg yolk and vanilla to creamed mixture. Blend completely. Gradually stir flour into creamed mixture a bit at a time until well blended, scraping the bowl constantly, just until dough begins to pull away from the sides of the bowl and no flour visibly remains. With floured hands, press dough into prepared pan. Dough will be thick. Use the heels of your hands to spread mounds evenly. With clean beaters in the electric mixture, beat egg white until it is frothy. Use a pastry brush to spread it over the top of the cookies. Long strokes with the pastry brush and egg white softens the dough, smoothing and evening out the top of the crust even further. Sprinkle nuts evenly over entire crust. Press them down lightly. Bake cookies for 45-55 minutes just until the edges begin to brown. Remove cookie sheets from the oven. Use a sharp knife to score cookies into 1 ½ inch squares. Cut diagonals across squares to make triangles. Cool cookies completely. Remove cookies from the pan with a spatula. Store cookies in an airtight container. Chop the nuts as finely as possible so they will adhere easily to the egg white coating on the surface of the Danish Butter Crunch cookies. Try using a steel blade in your food processor to pulverize them.